Since its inception, the French academic system, which trained artists beginning at the most rudimentary level, had established itself as the most powerful artistic institution until the latter half of the nineteenth century. Artists trained in the Ecole des Beaux-Arts often found themselves continuing the stylistic tendencies of their masters, intrigued by the public and private prestige it had afforded them. 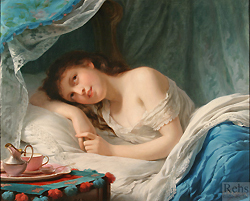 This “academic” style, with its meticulous execution, perfectly composed compositions, classicizing tendencies, and reliance on pre-established and thus, acceptable themes, was created and perpetuated through an intricate system of artistic training under well-established and successful teachers, prestigious awards, and a rigidly juried Salon. Many of these artists were schooled in similar academic traditions and adhered to this style throughout their career, finding success and patronage at the same time. Artists from throughout Europe migrated to Paris, the epicenter of the art world during the middle and end of the nineteenth century, seeking this training with the desire of establishing themselves as prominent artists. 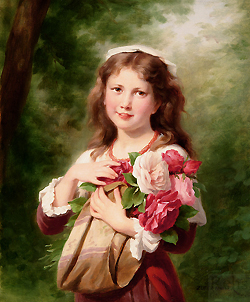 Fritz Zuber-Buhler was one of these artists who came to Paris in search of artistic glory, and became part of the large circle of academic artists coming out of the Ecole des Beaux-Arts system. 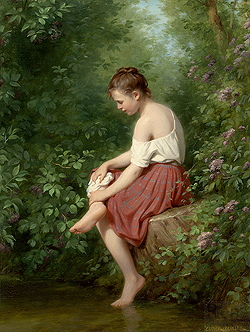 A contemporary of William Bouguereau, Zuber-Buhler’s canvases are indebted to the academic tradition in both their execution and theme, presenting dream-like visions of coquettish women, angelic young children, and hints of a mythological proclivity that created an oeuvre wholly in line with the academic ideas of idealized classicism. 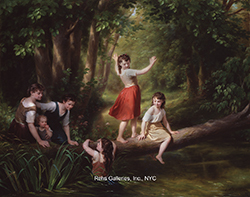 His Spirit of the Morning is an example of Zuber-Buhler’s creation of a dream-like realm of fantasy situated in a natural setting, featuring a softly rendered cherubic figure appearing as a fairy while Innocence reflects his interest in idealizing even the peasant children and their surroundings. His choice of imagery displaces reality with its fanciful and romanticized reinterpretation favoring a love of exquisite detail and an emphasis on delicacy. Zuber-Buhler was born in 1822 in Le Locle, Switzerland, but moved to Paris at the age of sixteen to begin his training with Louis Grosclaude before officially entering the Ecole des Beaux-Arts and the atelier of Francois-Edouard Picot. 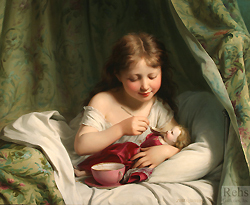 It was Picot who had created an entire artistic lineage of painters schooled in the academic style and tradition, as he himself was an academic painter originally trained under Jacques Louis David. 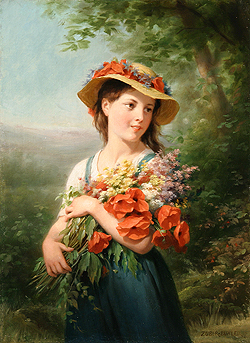 The teacher of not only Zuber-Buhler, but also Zuber-Buhler’s contemporaries such as Bouguereau, Alexandre Cabanel, Léon Perrault, among many others, Picot continued the principles of the academic tradition by passing them on to his many students, who equally became academic-style painters. Supplementing their basic, but rigorous, training at the École in Paris, many students continued to make pilgrimages to Italy, which remained a source of inspiration to many artists, whether for the possibility to view paintings from the old master’s or to learn an elevated form of landscape painting. According to some reports, Zuber-Buhler too left Paris to travel and study in Italy, reportedly at the age of nineteen. He was away for a period of five years. However, he is also said to have been a student at the Berlin Academy between 1843 and 1844. Zuber-Buhler may have spent time in Italy prior to undertaking further study in Germany, enriching his work with experiences both in and out of the studio setting. After traveling and studying in Paris, Italy, and perhaps Berlin, Zuber-Buhler returned to Paris to establish his career as an artist. 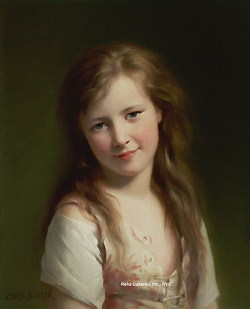 He began exhibiting at the annual Salon, debuting in 1850 with L’Enfance de Bacchus (The Childhood of Bacchus), La Madone et l’Enfant Jesus (The Madonna and the Child Jesus), Portrait de Mme la marquise de F… (Portrait of Madame Marquise), and with La Poussière Retourne à la Poussière et l’Esprit Remonte à Dieu Qui l’a Donné (Dust Returns to Dust and the Spirit Rises up to the God who Gave it). 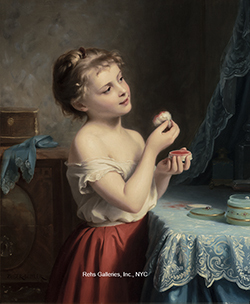 He continued to exhibit prolifically throughout his career, often entering several works in the Salon simultaneously. He began also to exhibit drawings, pastels, and watercolors into his oeuvre and equally submitted those to the Salons. In 1867 he exhibited in the United States at the Pennsylvania Academy of Fine Arts as well, showing The Pet Kitten, and also was part of the 1877 exhibition for which he received an award. It is clear that the style Zuber-Buhler was proposing for entry into the Salon was accepted by Salon juries and audiences alike, given the sheer number of paintings shown at his debut in 1850. 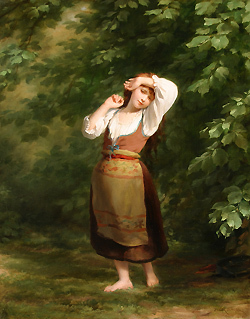 His entries also suggest to what extend Zuber-Buhler was interested in varying his themes, but nevertheless focused on themes that could cross borders and have a universal appeal. He was interested in executing works with mythological and religious themes, as well as completing portraits commissions. Both mythological and religiously inspired themes were of the highest order at the annual Salons and were looked upon with the utmost admiration. Zuber-Buhler continued to show at the Salon until 1891. He died November 23rd, 1896 in Paris. Throughout his career, Zuber-Buhler advanced the tenets of the academic style and showed his reliance on the artistic training provided to him at the Ecole des Beaux-Arts. He became part of a long and well-established academic tradition, which, by the latter years of his career, had entered a period of decline, not in terms of popularity with patrons, but in relation to the modernists who began challenging this academic perspective. Despite any rivalries between opposing artistic factions, Zuber-Buhler’s art would certainly have found popularity with both Second Empire and Third Republic audiences in France and would echo the growing prosperity of these eras. His works are now owned by the museums in Bern, Le Locle, and Neuchatel, Switzerland and in Montpellier, France.